This is one of my go-to starters. 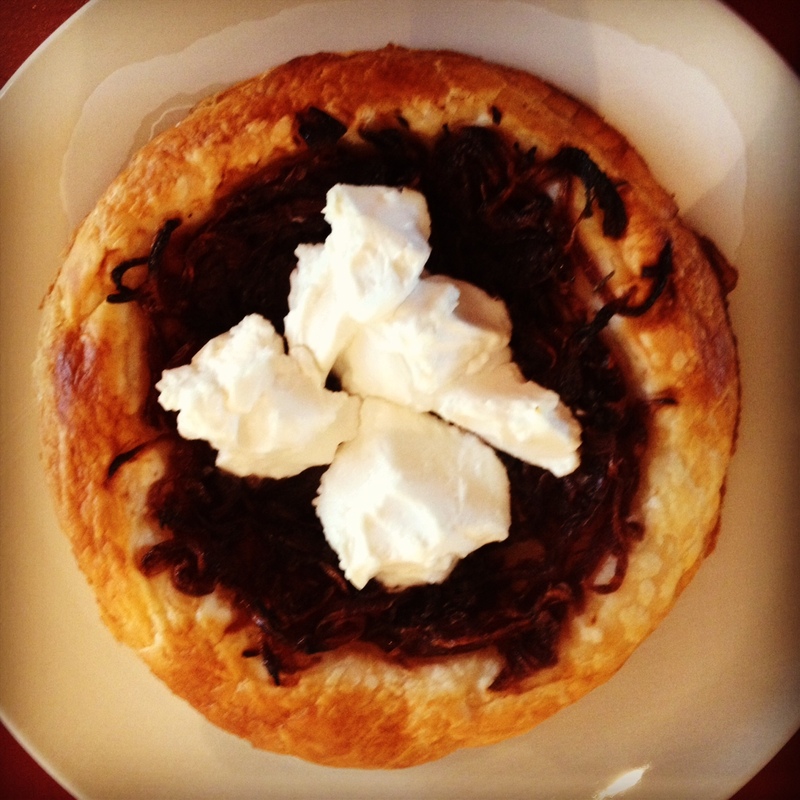 It is very simple to make, tasty and the red onion marmalade can be made in advance. You can make it vegetarian once you are sure the pastry you are using is suitable. I use shop bought puff pastry. I tried making it once with homemade shortcrust pastry but the puff is much nicer with it, and I don’t think I’ll ever be that person who makes homemade puff pastry! 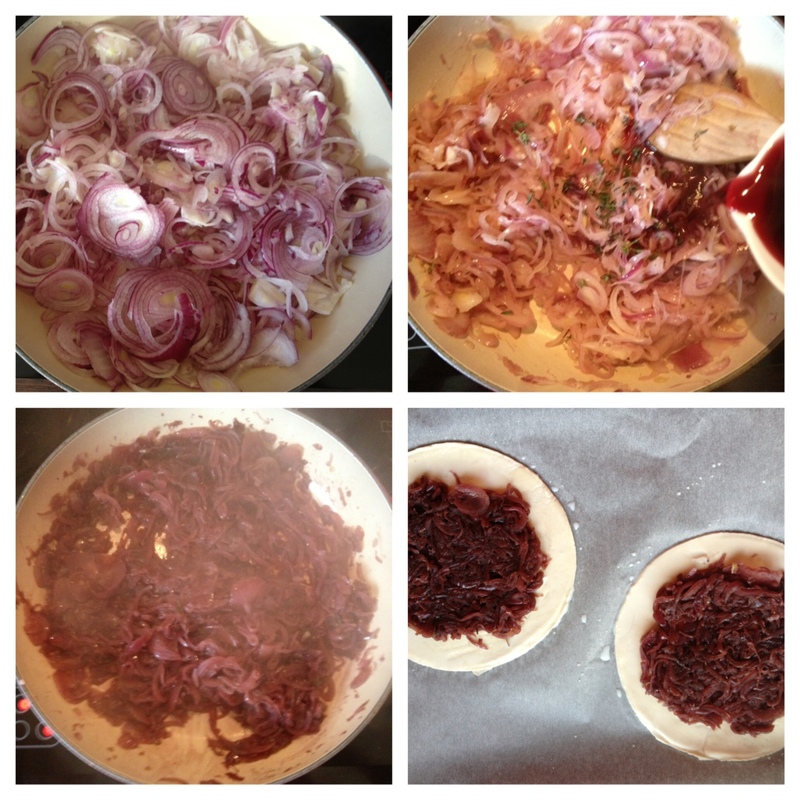 The red onion marmalade is from Neven Maguire’s Home Chef book. He has a great section at the back for larder staples and this is where you’ll find this recipe. I just add some thyme for a bit of extra flavour but that’s the only variation from the original. You can make the tart on one large sheet and divide up afterwards or make individual tarts like I have below. I use a mild soft goat’s cheese to make this. Check the instructions on your puff pastry for an idea of how long to cook it. I preheat the oven to 220c/200c fan/gas 7 and cook for between 12 and 15 mins. Roll out your puff pastry to approx 5mm thick. Use a small plate or bowl to measure and cut out a circle – I use a bowl with a 6” diameter. Place on a baking tray. You can line the tray with baking parchment but your pastry should have enough butter in it that it won’t stick. Spoon on your red onion marmalade, leaving a border of about an inch to allow the pastry to rise and give a nice edge to your tart. You can top the onion with the cheese now or add it halfway through the cooking time if you just want to warm the cheese. Brush either your egg or milk on to the pastry to give it a nice glaze. Your tart is done when the pastry is risen and golden brown. Make sure you’ve no soggy bottom! It is crucial that your onions are very finely sliced so that they will soften properly. Take your time slicing them or use a mandolin or the slicing attachment on a food processor. Heat the olive oil in a large saucepan over a low heat, add the onions and cook for about 10 minutes, stirring occasionally until softened but not browned. Stir in the garlic and sugar and then pour in the red wine and balsamic vinegar and strip the thyme from its stalk and add the leaves. Cook gently for about 35-40 minutes until thickened and sticky, stirring occasionally. Season with salt and pepper to taste. Allow the marmalade to cool before using on your pastry. Store the marmalade in an airtight container or sterilised jar in the fridge and use as required. Follow me on Bloglovin, Twitter or Facebook!